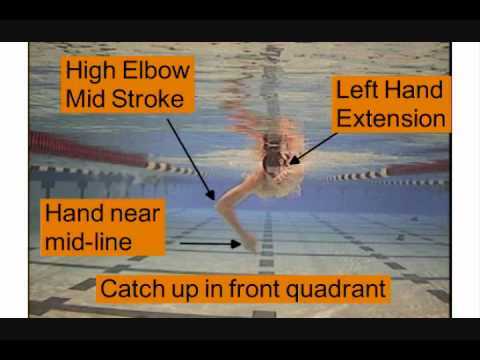 Why high elbows for front crawl? Effective front crawl arm action involves engaging the biggest muscle groups in the shoulder, for maximum power. Which are those? They are the lats. This is why swimmers historically have large wide shoulders, they have well developed lats. Experiment with this. Attach a rope or a bungie to something, then bend forward into the face down swim position. Pull on the role with your elbow bent and down. Which muscles are you using? Probably bicep. Now repeat the exercise, but keep the elbow high. Which muscles are you using now? 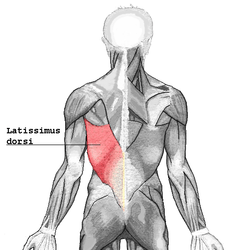 Yep, Latissimus dorsi, bigger and more powerful. Translate that into swimming. With your elbow dipped you are engaging the smaller muscle group thus disadvantaging yourself. Elbows high = more power = more speed!